It’s not every day that you get to build a Beta Business – a nimble business built around experimentation – within an existing enterprise. So when the UK’s third largest mobile network, Three, came to us to create a new digital telco, we jumped at the chance. They wanted a new sub-brand, a broader customer base and the chance to learn new ways of working. 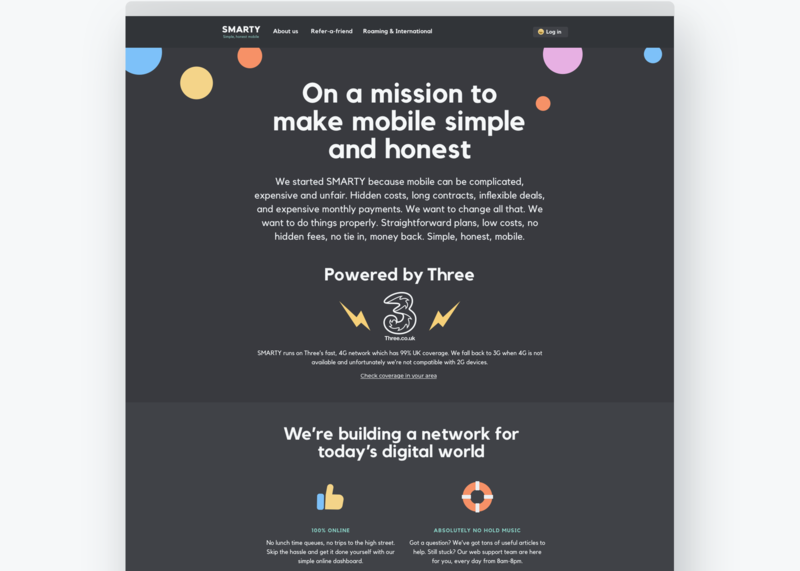 Together, we created SMARTY, a brand new mobile network powered by Three. 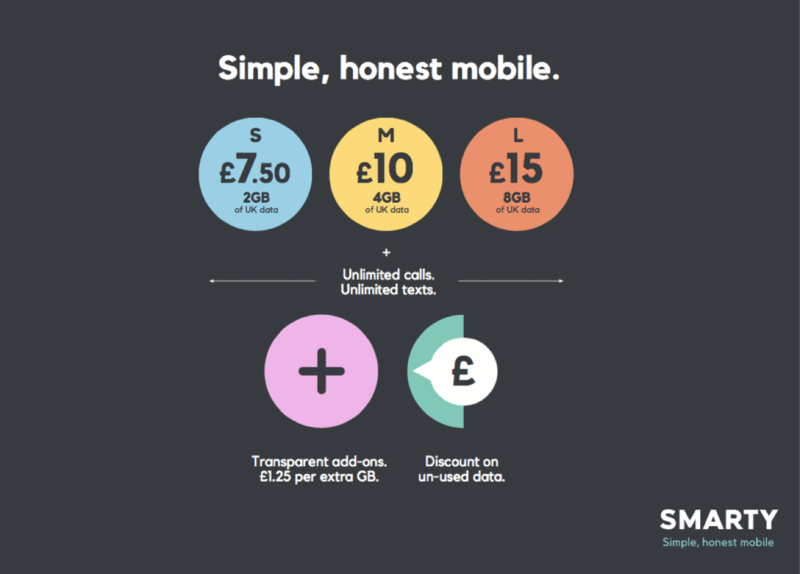 It’s exactly what a mobile network should be – transparent and easy-to-use. We created this brand-new business in under six months: from brand concepts to art direction, from digital design to packaging. All built and launched four times faster than normal. 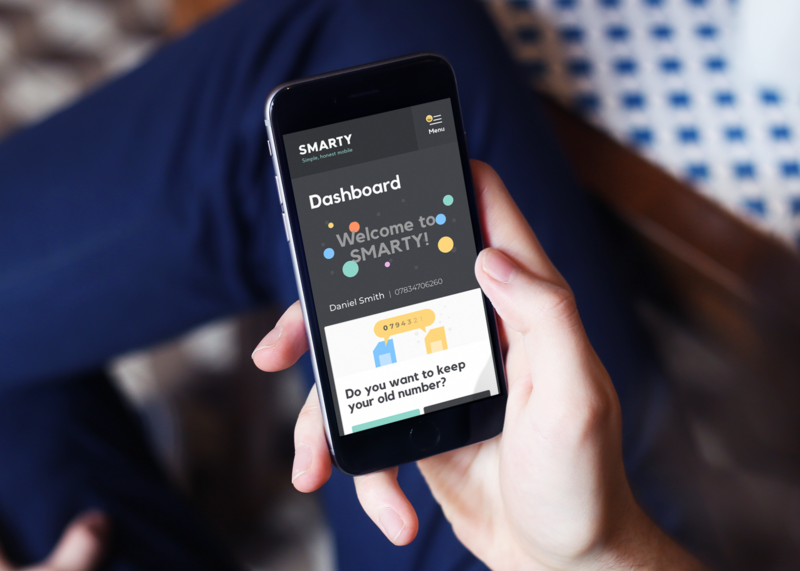 So far, SMARTY has taken a market by storm and has the highest TrustPilot score of any UK mobile network. Not bad for a baby business. First off, we needed to define what made this new business different to Three as a whole. So we spent time with the team to establish a purpose and mission: what we stood for and how we were going to deliver a new brand and business. We ended up with a clear vision of where we wanted to be, and used that to steer our decisions for the rest of the project. The UK mobile market is a crowded, competitive place. So we wanted to make sure SMARTY stood out. We started by talking to people. We asked them what they needed from their mobile provider, and what was broken with the service they were currently using. What would make them switch? People were fed up with complicated, inflexible plans, unfair charges, sub-par customer service, and generally feeling ripped off. Through research and co-creation, we defined and refined the SMARTY proposition, until we had the thing that people wanted – the the thing that made us unique. 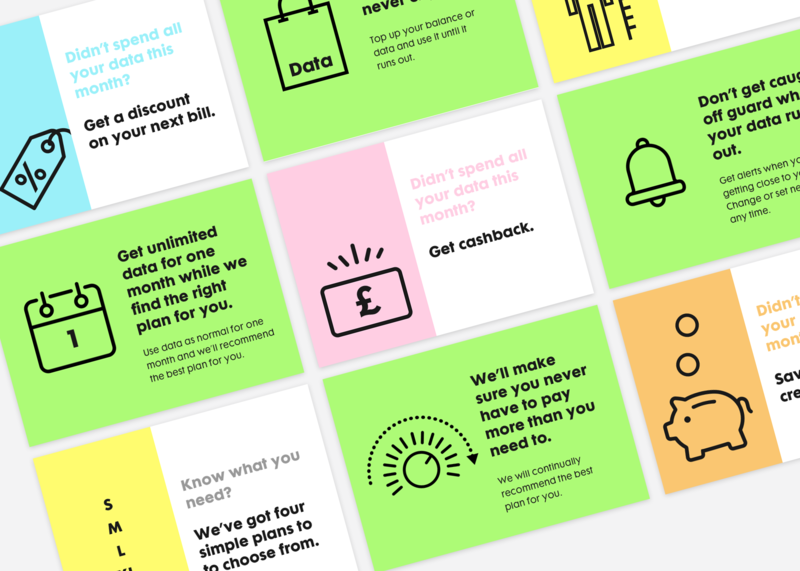 Simple, flexible plans, fair charging for add-ons, and a discount on your next bill based on unused data. To launch a mobile network, certain features have to work from day one. A customer needs to be able to register for a SIM card, pay for it online, get it delivered securely, activate it, move their phone number across – and so on. We call this the Minimum Viable Service. 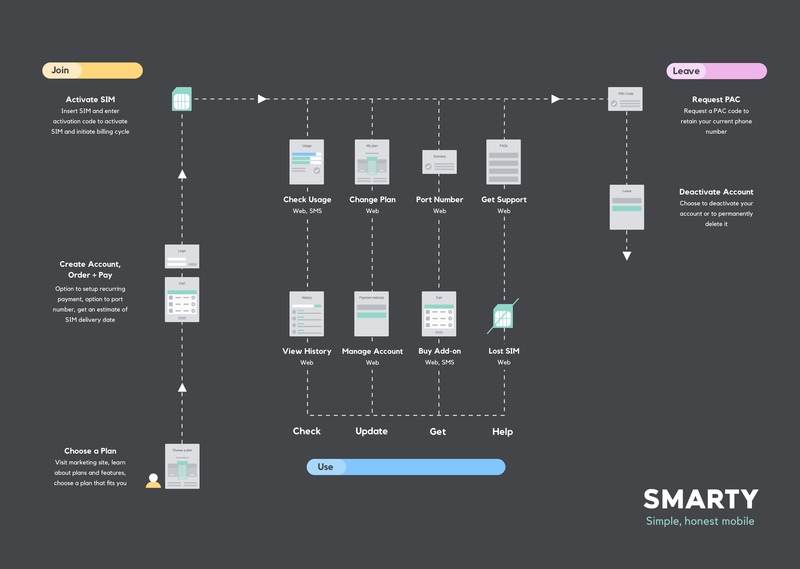 We defined and designed each of those features in turn, checking in with customers every time. What’s essential when choosing a plan, and what’s less relevant? How would they like to buy their SIM card and start using the service? Some of our initial assumptions were wrong. For instance, users weren’t as happy as we’d expected about getting a pre-activated SIM. So we scratched that. 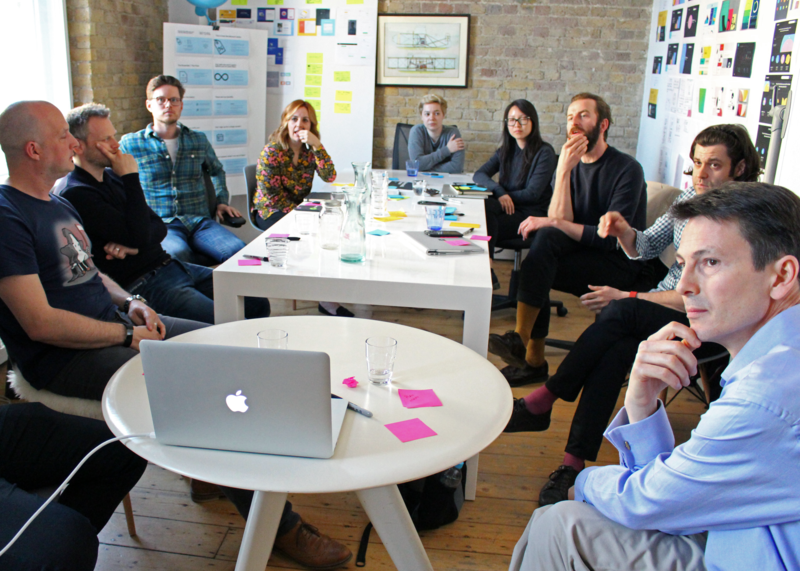 In our two-week design and build sprints, we came together with other teams on the project: brand, billing, network. Ultimately we worked as one project team, each focusing on different layers of the service we designed together. We focused on working code rather than in-depth documentation, testing and iterating like clockwork. To keep everything speedy, we used products for certain elements: Intercom for customer chat, Braintree for payments, PCA Predict for address look-up. But we always worked hard to make sure all these different elements worked well together – even down to the way we packaged our SIMs and send out customer emails. When everything was nearly in place, we alpha launched for a month – then it was finally ready to show the world. As with any new product, getting it launched is just the start. 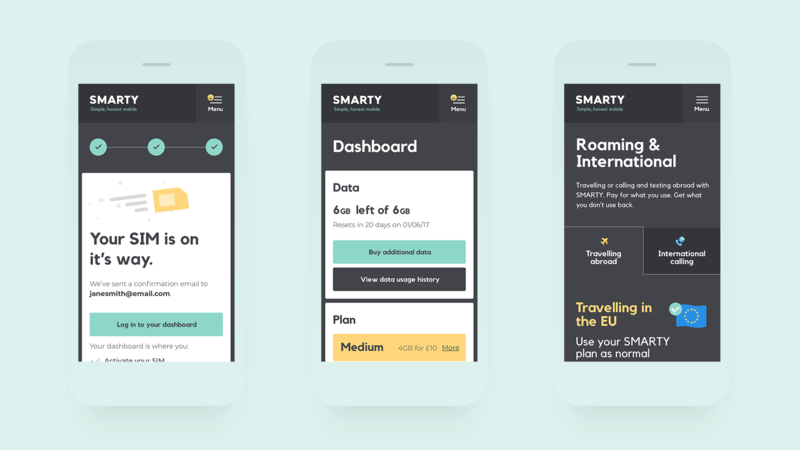 Now we’re growing SMARTY: iterating the experience, analysing new data and working on multiple experiments to reach and win new customers. And there’s a new arrival on the scene. Three were so happy with SMARTY, they wanted to launch something similar in partnership with another brand. So they’ve come together with Superdrug – the second largest health and beauty retailer in the UK – to launch a mobile proposition. Watch this space for more on how we helped them do it.